The target is 1,000 hectares by 1,000 farmers in 3 years. 3 months into the project, more than 200 hectares have been planted and 150 farmers engaged. The target is 1,000 hectares by 1,000 farmers in 3 years. 3 months into the project, more than 200 hectares have been planted and 150 farmers engaged. This is the WWF-Kenya Lake Naivasha Basin Reforestation Project and part of the larger Keep Kenya Breathing campaign that targets to grow 1 billion trees in order to bring back Kenya’s green and restore the national forest cover to 10% by 2020. Within the Lake Naivasha Basin, a total of 50 champions of reforestation have been trained in the verification and recruiting of new farmers. The benefits are already evident. A case in point of direct short term benefits that have started being realized are the profits gained from purchase of tree seedlings that were supplied by the nurseries of the participating farmers. Violet Muthoni, one of the tree nurseries owner says, “I appreciate the fact that the project has been brought to Naivasha Basin. The rate at which I have been selling seedlings from my nursery previously is not compared with the rate at which Lake Naivasha Basin is purchasing the seedlings. In fact, I am increasing the size of my nursery to accommodate more seedlings to support the project”. Local transporters are also experiencing a financial boom from being engaged to transport the tree seedlings from the nurseries to the eligible participating farms. Farmers continue to express interest in joining the project, with the current ones planning to even increase the acreage they have already planted in order to transform their farms, livelihoods and ultimately creating a difference to nature. 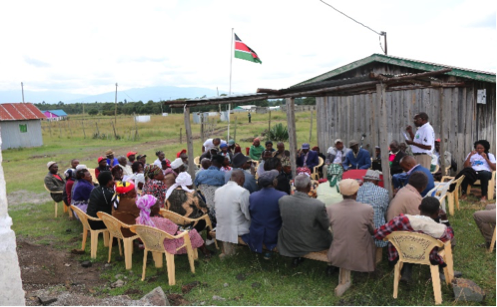 Interestingly, as part of the project’s mandatory involvement of both gender within each farmer’s family that signs up in order to encourage consultations of where to plant and what size to plant, the unprecedented outcome is cohesiveness within the family units engaged as part of initial feedback on the successes of the project. The #KeepKenyaBreathing campaign has so far witnessed the planting of close to 100,000 seedlings across the country. The anticipated long term benefits to tree growing that range from increased income from sale of timber and timber products, soil retention on the farms that will translate into increased crop productivity and favourable micro-climates cannot be overemphasized.